Most of the diamond coated drill bits – hole saws are manufactured without a pilot drill bit. People who are used the pilot drill bits from wood – plastic hole saws, may think of this as a missing component but it is actually done on purpose. Because pilot drill bits will crack glass – tile – granite, etc. To help starting the hole, we have a guide. If you have one of our sets that come with the PU case and insert, the inserts can also serve as a guide to start the hole. How to Use These Diamond Coated Hole Saws – Drill Bits? Please find the link to the DRILAX webpage for drill guide instructions. I recently purchased a set of 1.00 mm diamond drill bits. I would like to know if I can order 1.00 mm to 1.25 mm drills with a longer (deeper) cutting shaft. Please reply at above email address, thank you! 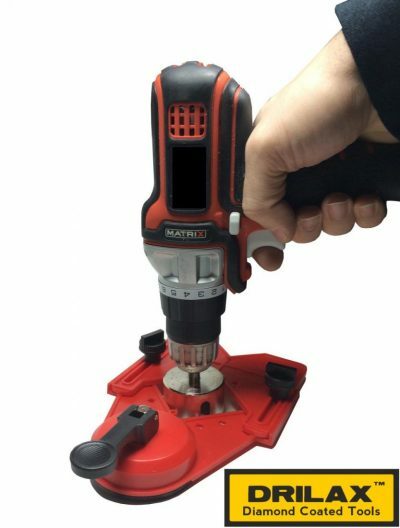 What is the MINIMUM diamond core drill size this drill guide will handle? Minimum Drill Bit Dimension: 1/8″ – if you remove the bearings. You are right, there is no keeper ring for that pin. We value your opinion and we will try to find a way to solve this issue for next design cycle. All our guides have been improved with an additional ring.